India’s recent startup revolution has created large companies in several verticals that are taking on global giants — in e-commerce, Flipkart and Snapdeal are taking on Amazon, and in fintech, Paytm is more than a match for Tez, and Oyo and MakeMyTrip take on Airbnb and others. But where India hasn’t thought to have had created many successful startups is in social space — India’s most popular social apps are all foreign, including Facebook, Instagram and more recently, Chinese companies like Musical.ly and Bigo. But while India’s top social apps are still created by foreign companies, there are some homegrown apps that are slowly moving up the pecking order. 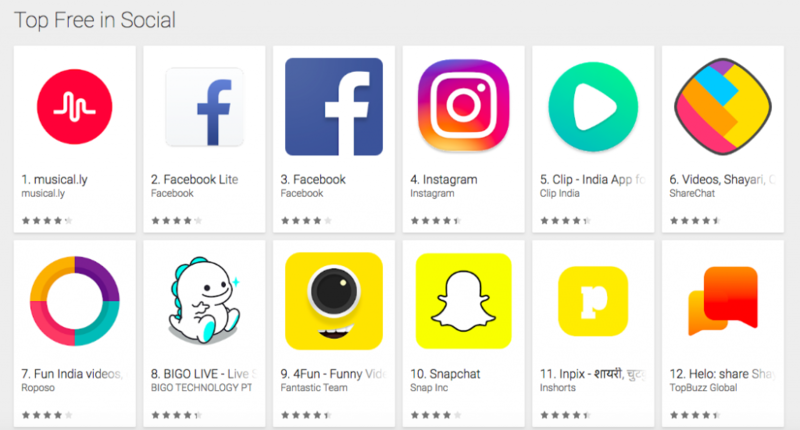 India now has three Indian apps in the top 7 free social apps in the country on the Google Play Store. More impressively, all three are backed by the same VC firm, India Quotient, which invests in Indian startups which it says will eventually become segment leaders in India. These apps are ShareChat at number 5, Clip at number 6, and Roposo at number 7. The top 4 spots are currently occupied by Musical.ly, Facebook Lite, Faecbook, and Instagram. If you’re reading this article, it’s very possible that you’ve never heard of these three Indian-based apps — they’re targeted towards Tier 2 and Tier 3 cities, and some, like ShareChat, aren’t even available in English. But while these apps have escaped the notice of much of urban India, they’re steadily gaining ground in the hinterlands. Thanks to their availability in Indian languages, and a focus on users from towns and villages, these apps are taking on — and at times, beating — global giants. Perhaps the best-known app on the list is ShareChat, which was founded in 2015 by IIT Kanpur alumni, and has since raised $23 million (Rs. 150 crore) from investors like Xiaomi and SAIF Partners. ShareChat is a social network in for the Indian user who’d rather communicate in their mother tongue — it’s now available in 14 languages, including Assamese and Bhojpuri, and lets users share videos and photos for their followers to see. ShareChat now has 4 million daily active users, who share everything from good morning messages to political discussions on the app. Another app that sort of competes with ShareChat is Clip— many videos with Clip’s watermark end up on ShareChat, and vice versa. Clip is a short-video content creation and sharing platform, and like ShareChat, is available in Indian languages. The content on Clip is similar to ShareChat — there’s lots of material which would do well as WhatsApp forwards, and Clip also allows users to create their own videos with themes and stickers. And the last app on the list is Roposo. Roposo was founded by IIT Delhi alumni, and had started off as a fashion-based social network, but has since pivoted to becoming, like ShareChat and Clip, an app to create and share videos in Indian languages. Roposo now claims to have 1 lakh videos posted on its app every day, and has over 5 million downloads. All three of these apps target a similar demographic, and all seem to cater to the need of the newly-online Indian to express themselves in their own language. It’s not as though other social networks aren’t available in Indian languages — Facebook is available in 8 Indian languages as well, but what these social networks seem to have allowed users to do is connect with like-minded people. That’s something that’s vital for social networks, and these network effects will stand these companies in good stead as they look to now take on the global biggies operating in India. And network effects is something that India Quotient, the common seed investor for these three apps, seems to focus on. “Our portfolio has consumer companies that have very high network effects”, it says on its website. And while many urban Indian entrepreneurs would balk at building an app where users talk in Bhojpuri and seem only to share good morning messages, India Quotient seems to have spotted an opportunity. “These companies solve rather unsexy problems of the rather common people of the world. We don’t care if it looks ugly, as long as it promises to grow like weed,” it says. But while these social networks have managed to garner millions of users, their economic viability might take some working out. The advertising dollars that a social network receives are usually proportional to the income levels of its users — AdSense revenue from Indian users, for instance, can be as little as one-fifth of the revenue from users in developed countries, largely because Indian users have much lower spending power than their Western counterparts. With these apps targeting Indian users that are outside metros, their monetization levels will likely be even lower than those from the average Indian user. And it doesn’t help that server and storage costs remain pretty much the same, whether is user is from Mountain View or Moradabad. But while these apps will need to figure out how to monetize — ShareChat doesn’t have a monetization model yet — they do seem to be breaking a bit of a glass ceiling for India’s social apps. For the last couple of decades, India has been using social apps that were made abroad, starting from ICQ in the early 2000s to Google-owned Orkut, and now Facebook. India Quotient, though its portfolio, is showing that Indians can be made to use social networks that were made by Indian companies. “You think the current social networks will fade away, like their predecessors, and you want to build the next one. From India,” India Quotient says is one of the reasons entrepreneurs should approach them for raising funds. The founders of ShareChat, Clip and Roposo sure seem to have come close.